On the splash page of B&W preview art for Infiltration #3, does anyone have any idea who the second Autobot from the right is? It looks like his alt mode is a Ferrari Testarossa, so it *could* be Freeway of the Throttlebots, but it's hard to tell with his back turned. Edited by TVsGrady, 10 February 2006 - 03:24 PM. 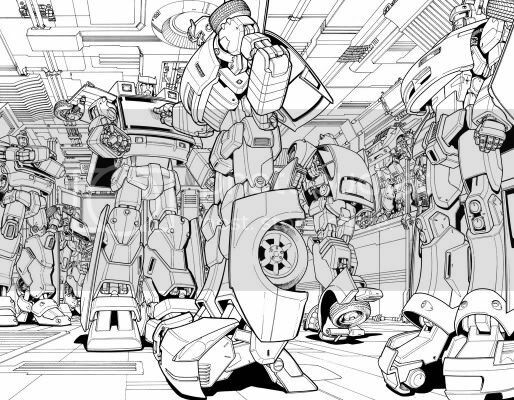 On the splash page of B&W preview art for Infiltration #3, does anyone have any idea who the second Autobot from the right is? Well, logically, it has to be either Sunstreaker or Wheeljack. Will Grimlock see a redesign? A more modern interpretation of the T-Rex that transforms in a classic fashion? "I will not be pushed, filed, stamped, indexed, briefed, de-briefed, or numbered! My life is my own!" "Chance works quite nicely if it has a canvas the size of the Universe to work with." BTW, Transfans interview with Tim Seeley, author of the latest Devil's Due TF/Joe crossover The Art of War. Maybe for Beast Wars. I certainly doubt we'll see a retrofit of MTMTE for G1 -- it was very tied to Dreamwave's continuity, has the old designs (butchered, in some cases, by the art and colouring) but is recent enough that IDW probably wouldn't want to target the same market. Cybertron... would probably depend on whether they did a Transformers: Cybertron comic. edit: Mass-market comic. I think they're doing something for the fanclub. Edited by Denyer, 22 February 2006 - 07:19 AM. just read on the frontpage that IDW will be reissuing MTMTE tpb's and releasing a hardcover thereof... that HC is SO MINE. then i can sell my volume 1 and my issues 5-8. Does anyone think that it's odd that Thundercracker has blue optics when it seems like IDW is going with the 'bots have blue and 'cons have red and yellow? Could the picture in the lineup be some kind of foreshadowing? Like how Ratchet pointed out that he was just a grunt and didn't take perverse pleasure in hurting others like Runabout and Runamuck. Or am I just grasping at straws? do the collected and reprinted Marvel UK comics cover all the issues? I thought I heard that they didn't, because they were initiated by one of the artists, so it only had issues he did. I take it then that there's little chance of the un-re-issued comics ever being re-issued? I thought I remembered a list of issues the reprinted collected works covered, and it seemed pretty complete, at least for what they had released so far. are they not going to go all the way to issue 1? of the USA Marvel run, I own originals of all but 2 of the 80-issue series. I've only ever seen a torrent for it once, and it didn't work. Think we will see some MTMTE style profile books from IDW? I'd love to see a Beast Wars and a Cybertron book. IDW would be more likely to reprint the Marvel Transformers Universe, complete with the extra entries in the G1 comic. Titan didn't reprint some stuff basically because Furman doesn't like his early work. Does anyone else do online comic subscriptions and have them mailed to your house? My only comic shop is about 30 minutes away and it is a pain in the fender to get to. I was researching some earlier today, but didn't find too much, plus I'm not sure how to get an incentive cover if I see one I like. www.mailmemycomics.com sells TFs subs for cover price plus $1for postage (per ish), each one sent an insulated mailer. They only list Infiltration, but if you e-mail them they'll hook you up with Beast Wars, Stormwhatever & Hearts of Steel too. So Hearts of Steel just got me back into comic shops, and I found and bought all of War Within Volume 2, having only ever read Volume 1. Should I bother to pick up Volume 3? I know it isn't finished, but are the 3 issues that were released worth picking up? Is there any kind of ending? Well, it's fairly easy to see where things were going, because we got the solicitations at the time -- more would be discovered about what Megs had been up to, followed by Prime coming back and a big fight. I'd wait to see if it gets a direct-to-trade conclusion first, personally. NICE. Bludgeon's new duds are looking like they'll be cool.